Don’t get stuck against a wall. Keep your adventure Camera Charged. Never miss a facebook update or that live cricket score ! Six protection circuits that does intelligent charging. IPX5/IPX7 Certified All Weather device. Intelligent power draw from your bike’s battery. NVH – Noise, Vibration and Heat Resistant. Durable Alloy Design, Abrasive Resistance. Ensures your bike can be self started everytime. Safeguards your bike’s battery and your device. 1 Year Limited Warranty. We pride ourselves on the quality of our products. Register your product at www.myresonate.com for best support. Features and specifications are subject to change without notice. Yes. ChargePLUS is designed for everyday use so that your phones will never be out of charge for that important call from home. Will it work with my Harley Davidson Fatboy? How do I fix ChargePLUS on my bike? Will my bike's battery be affected in any way? No, ChargePLUS is carefully designed with several safety protection circuits to ensure safety of your bike’s battery and the device that you intend to charge. There are range of bike mounts available for your SmartPhone, GPS, GoPro specific to your lifestyle. Alternately your phone can be kept in the storage flap on the tank if you have one. Is there a warranty for ChargePLUS? 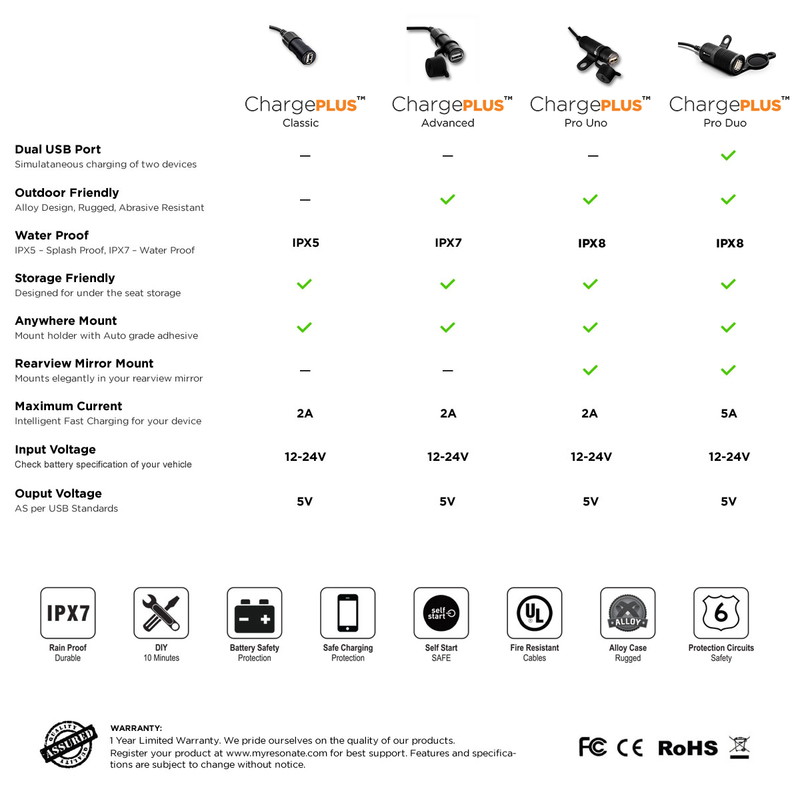 For your complete peace of mind, ChargePLUS comes with 1 year limited warranty. How long does it take to fix ChargePLUS on the bike? Depending on the location of the bike's battery it may just take about 5 to 15 minutes. When will the Pro version (Dual USB port) be available? Awesome. I need one, Where can I buy? How to claim my warranty? Please write to care@myresonate.com to initiate an RMA. RESONATE will ship a brand new ChargePLUS for your continuous 'On The Go' Charging experience.